The daily diet is the only source that the body has of obtaining the nutrients it requires. However obtaining the diversity and density of nutrients needed for the human body to function properly has become a recognized challenge, given our modern lifestyles and in many cases the quality of the food available. The inevitable dietary gaps that result support the fact that virtually everyone can benefit from nutritional supplementation. 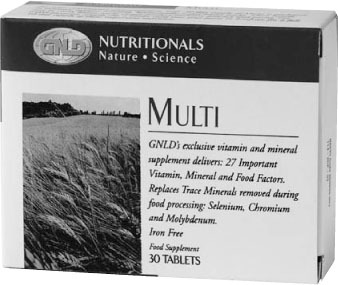 A broad spectrum, comprehensive formula, Multi, carries forward the GNLD tradition of nutritional excellence by providing an ‘entry level’ formulation that is iron free and delivers a daily supply of key vitamins, important minerals and trace minerals. Multi ensures that everyone has an opportunity to prevent the occurrence of dietary gaps which scientists have confirmed have definite health consequences. Why take a daily vitamin and mineral supplement? Because the human body requires a wide variety of nutrients to be its healthy best. Because many diets do not provide the density and diversity of nutrients needed to assure optimal health. Because modern food processing has stripped important nutrients and trace minerals from packaged foods, which have become the staple of our busy lifestyle diets. Because nutrients can become depleted by physical or emotional stress and must be replenished. Because vitamins and minerals are essential for optimal health. Because some substances which are critical for normal physiological function cannot be manufactured by the body and may be deficient in the diet. Comprehensive formula. Our unique formula delivers a broad spectrum of key vitamins, important minerals and trace minerals which are necessary for optimal body functioning - all working together to bridge dietary gaps. Replaces trace minerals that food processing strips away: selenium, chromium and molybdenum. Convenient once - daily regimen provides you with an abundance of the vitamins and minerals your body needs. Iron free, for those who already obtain sufficient iron in their diet. Entry level product preventing the start of dietary gaps. 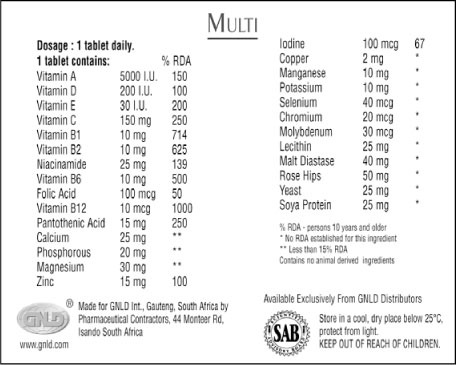 Comprehensive formula: key vitamins, minerals and trace minerals. Replaces trace minerals that food processing strips away:Selenium, chromium and molybdenum. Convenient: Each daily dose packaged in a hygienic blister pack.